"I was kind of making a joke for Union County, and it just went viral," David Danielewicz told NBC Charlotte. "I've seen people combing their kids' hair, letting them finish their cereal, truly amazing." EDITOR'S NOTE: After NBC Charlotte posted this story, several viewers pointed out that the original post was from a mother in Nashville, Tenn. NBC Charlotte spoke with David Danielewicz, and he confirmed that he didn’t write the post, but “… shared it from another post.” The original post can be found here. 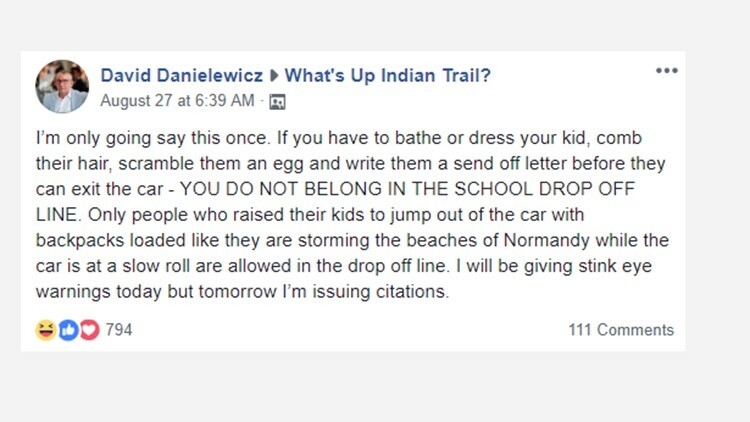 A Facebook post by an Indian Trail dad regarding school drop-off and pick-up etiquette is going viral. On the first day of school, David Danielewicz posted a bit of a rant. "I'm only going to say this once. If you have to bathe or dress your kid, comb their hair, scramble them an egg and write them a send off letter before they can exit the car - YOU DO NOT BELONG IN THE SCHOOL DROP OFF LINE. Only people who raised their kids to jump out of the car with backpacks loaded like they are storming the beaches of Normandy while the car is at a slow roll are allowed in the drop off line. I will be giving stink eye warnings today but tomorrow I'm issuing citations." Thousands of people shared, liked and commented on the post. "I was kind of making a joke for Union County, and it just went viral," David told NBC Charlotte. "I've seen people combing their kids' hair, letting them finish their cereal, truly amazing." Ulunda Baker, another Union County parent, was one of the commenters laughing out loud over the frustrating reality. "I think the struggle is the waiting," she said. "It just takes so long," Ulunda explained. She said it takes about an hour to pick up her two boys from Union Academy Charter School. "You can never beat the grandmas and grandpas," Ulunda laughed. NBC's Today Show shared these seven unbreakable rules of the school drop-off or pick-up line.